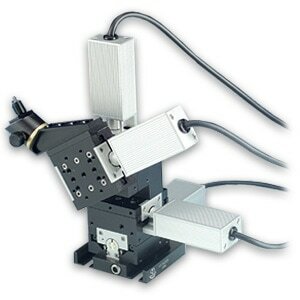 The MX7600 motorized crossed roller bearing micromanipulator is ideal for patch recording experiments. The MX7600 offers exceptionally smooth linear travel and uses a precision preloaded lead screw to ensure drift-free operation. The motorized 4-axis micromanipulator incorporates our MXC-45 pipette holder mounted to an adjustable clamp on the Θ axis. This clamp allows the MXC-45 and Θ axis to be adjusted to the desired angle of approach from 0° to 180° for true axial approach. The MXC-45’s built in rotational stop allows easy pipette replacement. The MX7600 can be used with our e series and MC2000 controllers to drive the 7600 stage through a closed loop interface between the controller and the motor encoder. The closed loop connection ensures 0.2 μm and 0.1 μm resolution, respectively. The encoder coupling also enables the use of the DR1000 digital readout for repeated or relative positioning requirements. All cables are shielded to ensure noise-free operation during sensitive electrophysiology experiments. MX7600 series stages come standard with our ABP-R mounting plate. The design of this mounting plate enables coarse positioning between platform mounting holes as well as 360° of coarse rotational positioning. If rotation with a solid submicron level stop is required, the MX-RS rotation stage is designed to mount directly into the ABP-R and has mounting holes to attach to the base of the MX7600.